There’s a lot of factors that impact real estate prices, but they all ultimately depend on liquidity. Liquidity is just a way of saying there needs to be people that want to buy your home, and have enough money to buy it. The money used to come from income and savings, but in the late ’80s banks started extending more and more credit. To rip a page out of the Wu Tang Financial planning guide, we replaced cash with credit in CREAM. 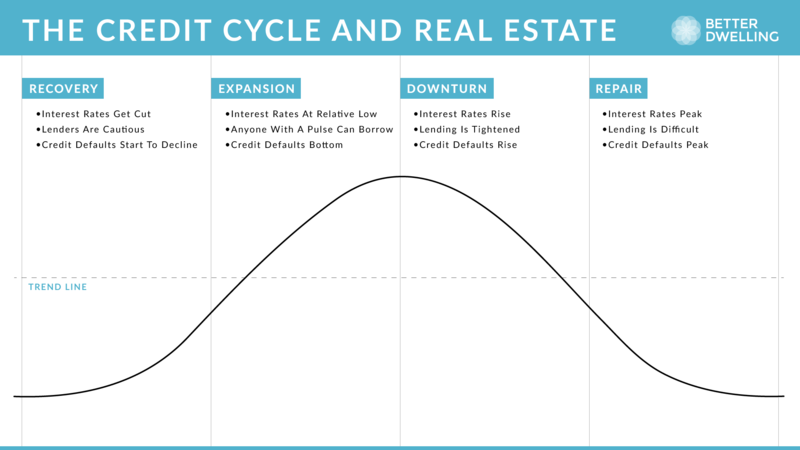 That’s why you should get familiar with the credit cycle, and how it impacts real estate markets. Today we’re going to break the credit cycle down into four categories – recovery, expansion, downturn, and repair. The credit cycle doesn’t give a s**t about how much density you built, or whether or not you’re on a South facing lot. The cycle is based on availability of credit, and the expansion and contractions it makes. It’s actually such a force, post-Keynesian economists like Minsky believe it drives the business cycle. Since credit availability and income are major factors in home buying, it plays a pretty big role in the housing cycle. Let’s start with the recovery phase, when damage from the previous cycle is being repaired. During this phase, credit and asset growth is relatively flat. Defaults and unemployment peak, and things start to feel normal. Interest rates are cut to “stimulate” the economy, and household debt starts growing. The impact is increased liquidity, which is bankster for “people can start buying s**t.” The increase in liquidity allows asset prices to grow, which makes it easier for banks to lend. The credit expansion phase is exactly what it sounds like, it’s when credit expands – very quickly. Have you ever heard that a loan is easiest to get when you don’t need one? That’s what’s happening here, but with whole economies. Wages grow, unemployment falls, and credit defaults print new lows. The increased wealth from the employment boom meets low rates to create a lot of leverage – and fast. During this phase, debt rapidly expands, but it’s fine – the job market is booming [insert eyeroll]. Asset prices like stocks and real estate make very sharp climbs. Sadly, all good times come to an end in a phase known as the downturn. This phase is a transitional phase, so it starts very differently from how it ends. In the beginning, credit growth trends lower and stabilize at a lower rate. Debt is still growing, but much less than it was just a year before. Defaults start to gently climb, and assets start to lose luster. The slowing of credit growth adds up towards the end of this phase. The economy grew so quickly during the expansion, everyone forecasts huge growth. That growth can’t be met, which leads to a sudden halt in spending, and rise in unemployment. Credit starts to tighten as lenders carefully chose new borrowers. The end of the phase is usually marked by a recession, fast falling asset prices, and soaring defaults. Usually about a tenth of the population is severely impacted. Fun Fact: The Bank of Canada just warned about 8% of the population will be impacted by rising interest rates. No, the doom doesn’t last forever. The economy just needs to fix the inefficiencies caused during expansion. A recession is a necessary correction of human and financial capital. During the repair phase, the reallocation begins. Households deleverage, meaning household debt decreases. Unemployment begins to drop, and credit defaults start to bottom. Interest rates are about as high as they can get, and may start getting cut. Asset prices start to make a gentle climb back higher. The annual percent change in mortgage credit growth, adjusted for inflation. Real Canadian home prices are plot as annual change per quarter, for reference. Source: Bank of Canada, US Federal Reserve Bank of Dallas, Better Dwelling Calculations. Rinse and repeat, for as long as people will over and underestimate expectations. I’ll let you decide where in the cycle we are, but properly assessing risk is how you make and keep wealth. There can’t always be a right time to buy every asset, otherwise someone with a lot more money would beat you to that 400 sqft condo. Now enjoy real estate agents and economists discussing the credit cycle for the next few months. Always glad to help. Great read as always, but people are still saying we’re in the expansion phase. Prices are still rising almost everywhere in Toronto. Vancouver seems to be an exception with falling prices. Credit cycles are national, not local. B-20 was tightening for most of the country. B-20 was to address specific problems in Toronto and Vancouver. The rest of the country doesn’t have a problem, but we’re impacted by the ignorance that flows from Toronto buyers. OSFI’s mandate is to protect bank liquidity. Since banks are national operators, they need to tighten credit *everywhere. * The whole country’s prices increased nearly 14% last year. Under no circumstances is that sustainable growth, now banks need to mitigate their own risk. Credit unions have tightened their lending as well, and they aren’t subject to OSFI regulations. The environment is just deteriorating, especially with our trade partners. In the last quarter Waterloo has trended down by 5-8% in price, volume is dried up by over 30%. Also in Vista Hills neighborhood where the developers had line ups for new builds in 2016-17, and were turning people away last year, they can’t even sell the “immediate possession” homes and multiple that I’m watching have dropped 10k (3%) and 40k (5.2%) in just the last 60 days. The GTA is currently skewing the Ontario/national average at this point in time, as the downtrend here is very real. The downtrend in the GTA is also very real, the media just hamming up bad reads on the numbers. For example, August was better than last year, but it was still the second worst August in over two decades for sales. Most cities in Canada are at least twice as expensive as similar sized cities in the US, due to the easy lending schemes. Only half of the HELOC debt across Canada is located in Toronto, Vancouver, and Montreal. Let’s not forget that there’s inflated equity from people borrowing an living off of fictionally inflated land values. The bigger issue is people who sold in GTA (mostly boomers downsizing/retiring) moved to small towns like Peterborough and jacked up the prices there so that people living in those communities could no longer afford to live there. The same thing has happened in Prince Edward county near Bellville. It is what is referred to as contagion. ppl are idiots how can we be in an expansion phase, since spring of 2017 we have had government changing rules on housing (buying/ selling and renting) , interest rates have gone up ( theres another on coming october 24th 2018), banks have tightened on their lending unemployment has been on the rise. all factors which dictate (according to this article) that we are in a downturn. ppl are delusional. We have just started a long and protracted downturn. The general public is always behind the trend. Wait about 6 more months and the real downturn will start as the public starts to feel the effects of rising rates and a stalling economy. Prices are rising? Who told you that nonsense? Real data. Real people. Real nerds. 😂 nerds in the best possible way though, right? Nerds in the only way! The older I get, the more appreciation I have for the term. In fact, I laugh at someone who tries to use the term ‘nerd’ as an insult, because it is really a backhanded insult on themselves… I mean, really, you’re making fun of someone for being smarter than you? You’re calling yourself inferior? You Need to Diversify Yo Bonds! This has nothing to do with buying bonds. It can be argued that we’re in the expansion phase since we’re still seeing population grow very quickly, especially in Toronto. It depends on the population growth. I emigrated here in the late 1980s when immigration was really high. By the early 1990s, it was very, very difficult to get a loan for a mortgage. Nothing like today. Actually, today was nothing like 10 years ago either. The federal reserve is raising rates and reversing qe. That’s already caused currency crisis’ in Argentina and Turkey. The ten year treasury has hit the highest yield in 7 years and will continue as long as inflation continues in the states. The BoC must keep pace with the fed to keep our dollar stable and long rates are rising. It’s exactly the downturn part of the cycle. Sorry you couldn’t make it to speak at Veritas, would have loved if you could have made a deeper dive on this topic. Waiting for that Minsky moment, when credit collapses overnight. Check out the US bond market, insiders already see the issue boiling. It usually takes a year for regular consumers to understand the impact of today’s credit changes. Bond market is definitely getting a little shock South of the border. Only a matter of time before we can stop offering cheap credit. OSFI didn’t implement B-20 to save hope prices, they did it to preserve liquidity for better quality borrowers. Above 3% on the 30’s. Gundlach is calling it a new paradigm for higher interest rates. The age of low rates are done, unless there’s a global financial recession worse than the Great Recession. The latter seems unlikely, but higher rates killing home prices, and moving North to Canada is very likely. Also note the US treasury bonds right now that are pushing up USDCAD and will continue to do so, as that will add more inflationary pressure as the value of CAD drops, and Poloz will have to continue to hike whether he wants to or not. He doesn’t have to, there appears to still slack in the labour market because wage growth is now coming under inflation. Also, BOC forecasted headline inflation to cool down to the 2% range. We did not get any tax cuts like the US, and also US stimulus (rock bottom rate, QE) was WAY more than ours. What the hell is Wu Tang financial? We could definitely be in the expansion phase, we certainly have been in one for the past 10 years. The real question is how much longer will we be in an expansion phase and when will the next phase begin. The credit tightening kills spending, which kills employment. Once employment’s legs get kicked out, immigration slows down. Look to the boom and bust in the late 1980s to early 1990s to get an example. Nope, gov is actually increasing immigration to 370K by 2020, + more concentration of economic category, not just old people to collect free social benefits. By 2030 (?) all population growth in Canada is forecasted to be from immigration. Reminds me of the Jesse Pinkman digital animal scene from Breaking Bad. Music is blasting but the party people are spent and have left. Veritas has been negative for the past decade. Notice that this is their ‘7th annual conference’? I think their philosophy is to be overtly negative and eventually be proven ‘correct’. That place is a joke. Having said that, I agree that the housing market is certainly poised for a correction. It’s just that the timing is impossible to nail down. Didn’t they have developer schmucks come in a few times? Being in the market, I am still seeing too many buyers who are clueless about the real estate cycle. Still many of the over-priced and problem riddled homes are sold to unsuspecting buyers. who do not do their due diligence. Clearly we are in the “Downturn” market. Also, too many sellers are saying ” well the house down to road got 1 million dollars 6 months ago, so I want 1.05 million dollars today” They are not accepting the reality; that house is worth only 900k. And, by next year, it will be 850k. Don’t be surprised. Majority still believe home purchase is the best investment, regardless where we are in a credit cycle. I’m seeing suckers shedding over a million on a three bedroom shacks in 905, by 2020 those will shed at least 30% in value. If I remember this cycle for one thing it will be the “coming soon” real estate signs. I cringed the first time I saw one in 2010, cringe even more today. I know a buyer who tried to sell last year on market swoon, couldn’t sell. Sold to active listings are still tight in most segment (2-3 month) except York. This can still cause price pressure UP. If you actually take away luxury real estate, average price on normal homes have barely come down since the peek. Also I don’t think peek price was accurate, since thousands of homes didn’t close. But TREB doesn’t revise failed closing numbers. At that time, prices for detach were going up 100k / month, so it’s questionable if that was true peek price. I would argue most have kept gains except York Region. Looking at the HPI shows this. And condos, well they surged. Have to give a nod to Stephen for the Chappelle Show reference and even making the first letter of each heading spell out CREAM. Tha’s why I put all my money in krona. I know it’s a joke, but those Swedes are looking like they’re going to need to need to kick inflation up to solve their bubble as well. lol didn’t know you were old enough to know the song “Cream” by Wu-Tang. Economist David Rosenburg thinks the BOC doesn’t have to raise rates after this month’s expected hike. He is usually very bearish on the CAD economy, but today I thought he made a balanced argument. Agreed, the BOC might raise rates, but I can see them readjusting their expectations. I wouldn’t be surprised to see them set the inflation rate higher to devalue the existing household debt. That sets up a very bad business environment though, and is actually very similar to the 1980s. Job creation back then was being created by foreign companies, since the labour was so relatively cheap in contrast. Mexico-light. That’s not going to work unless we see wage inflation across the board and job gains aren’t mostly part-time or government jobs. The US literally doesn’t have enough workers to fill the positions available and are finally seeing wage pressure. BOC is raising rates period. They are already too far behind The Fed and will have to do so to sure up our dollar. Our wages aren’t keeping up with inflation as it is.